Advances in plant ecology and evolutionary biology have clear applications to plant materials choices for ecosystem management that may have long-term impacts on ecosystem resilience. There is a need to balance the preservation of locally adapted genes with the desire to develop native plant materials that are genetically diverse and can respond to ecosystem changes. However, there is often a disconnect between the types of research being conducted and that which is needed for application to ecosystem management, as well as between researchers and restoration practitioners. How do we develop knowledge surrounding topics like gene flow and local adaptation in a way that can inform native plant materials selection? 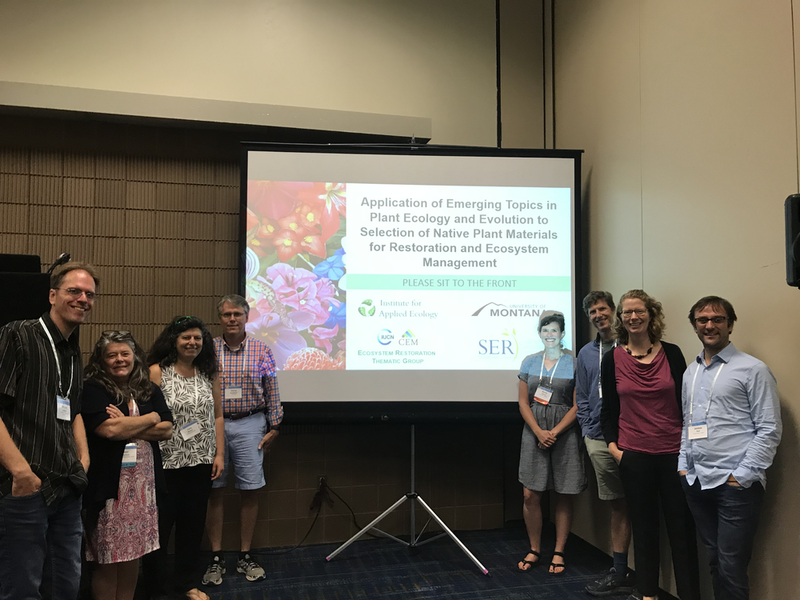 On August 9th, the workshop on Emerging Topics in Native Plant Materials at the Ecological Society of America Annual Conference in New Orleans brought together fifty participants to discuss these issues. The session started with initial talks by a range of researchers in this area: Jeremie Fant (Chicago Botanic Garden), Danny Gustafson (Citadel), Julie Etterson (University of Minnesota), Karin Kettering (Utah State University), Rick Lankau (University of Wisconsin), Tom Kaye (Institute for Applied Ecology), Cara Nelson (University of Montana), and Alexis Gibson (University of Montana). The majority of the workshop was spent in group discussions surrounding topics related to population combination, seed transfer, unintentional agricultural selection, rapid evolution, and using local materials in an era of rapid change. Some of the main barriers to research or implementation and discussion takeaways are outlined below. ● Plant establishment is the most critical step that outweighs all other issues associated with plant genetics. ● Site conditions, including both the physical environmental (e.g. drought stress) and the biological environment (e.g. competition for resources from invasive species) can determine the extent of seedlings establish from seed. ○ Local adaptation of seeds (genetic factors) can affect seedling establishment and subsequent survival, especially when tested by extreme environmental events such as drought, heat or cold. ○ Environmental and genetic factors can interact - the effects of genotype on seedling establishment may depend on environmental conditions. ● The selection of different seed sources depends on the restoration goal. ● Environmental or ecological distance matters more than geographic distance when matching seeds to sites. ● Novel environments challenge the interpretation of what is "locally adapted." The genotype that grows best at a site may not be the type that grew there historically, or even currently. ● The use of the term "local" to describe local genetic types or local adaptation is unscaled and may be inappropriate altogether. For some species, local means the home site (e.g. serpentine endemics), while for others local may be measured in 100s of miles (such as estuary plants that are routinely moved long distances by birds between relatively homogeneous conditions. Therefore, what we mean by local needs to be defined for each situation and possibly for each restoration goal. ● Recent suggestions about the advantages of different seed mixing strategies to maximize adaptability vs. minimize risk (Bucharova et al. 2018, Crow et al. 2018) should be interpreted as well-informed hypotheses that need to be tested formally through ecological experiments. ● Seed zones that have been proposed and even implemented based on common garden studies and climate data, such as those in the US, are imperfect and need to be tested further. ● There is an overwhelming amount of unknowns, thus a need for a framework to approach addressing these issues systematically and from different sides. ● It is important to get temporal and numerical data to understand dynamics of changing population over time. ● It is important to require a source-identified seed certification nationally. Reporting criteria should include: generation number under cultivation, number of source plants, location of populations, number of mother plants in addition to standard seed collection data. ● There is a potential to use existing selection pressure (i.e. climate, disease, pollution) to find the individuals that may be good source materials for restoration in the future. ● How long can we keep wild populations in cultivation before they start to evolve? ● How many populations should form the base populated of cultivated populations? ● How do the answers to these questions vary with the species? With the goals of restoration? Funding sources and management organizations/agencies? ● If you have seed sources that have undergone evolution, what are the impacts of that once they have been planted on the restoration site? ● Managers may want to try new methods for population combination or seed transfer, but may be constrained by regulations or avoidance of failure. ● Rare species are highly desired in restoration but may carry risks associated with inbreeding depression, low genetic diversity, and limited dispersal between populations. o Emerging genetic evidence indicates that climatically buffered ecosystems (OCBIL; Hopper 2009) may operate at different genetic spatial ranges and with less evolutionary flexibility than post-glacial ecosystems (YODFEL) and require more research. ● We don’t have a clear understanding of when outbreeding depression is a major factor during restoration, or to what degree it impacts project success or limits population combination. ● How should rare species (with small populations) be treated within large-scale restoration efforts (as they are likely to have particular issues with inbreeding depression, low genetic diversity, and limited dispersal between populations)?